The exterior of the Cathedral of Florence is covered in a decorative mix of pink, white and green marble. The interior, by contrast, is pretty stark and plain but quite enjoyable on warm summer days since the temperature inside tends to be cooler. The mosaic pavements are certainly its main attraction within. 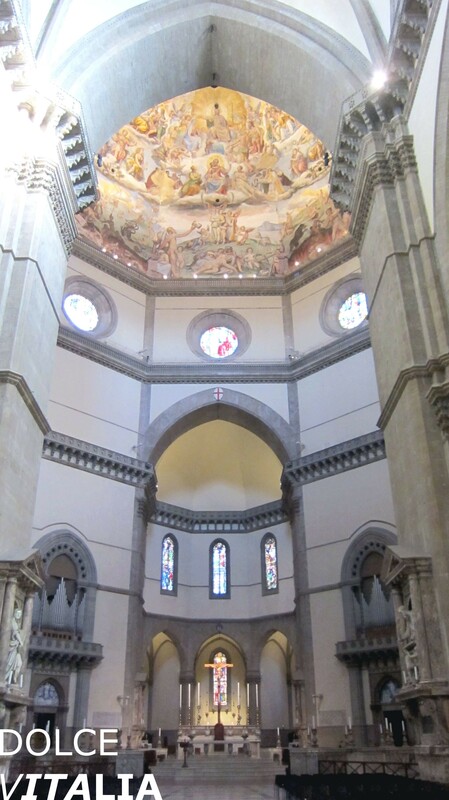 The biggest artwork within the cathedral is Giorgio Vasari’s frescoes of the Last Judgment (1572-9): they were designed by Vasari but painted mostly by his less-talented student Frederico Zuccari by 1579.